* Phase 3 Next Generation Plate Is your 4.6 liter 2 valve motor a little light on torque and horsepower? NX has the solution to your problem! The Nitrous Express 4.6L 2-Valve Plate System feature's Phase 3 Spraybarless technology for the ultimate in atomization and distribution. The billet plate bolts between the throttle body elbow and the intake making installation quick and easy. 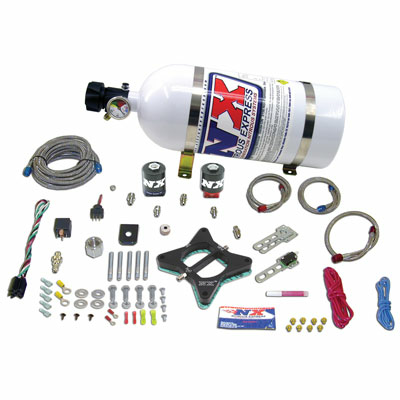 This system includes Lightning series nitrous and fuel solenoids. Also includes is a wide open throttle switch so the nitrous only activates at wide open throttle and automatically turns off when you let your foot off the accelerator. To make installation even easier, ford fuel rail adapter fitting is included so there is no need to splice into the factory fuel lines. The system includes jetting from 35 to 150 horsepower and can be upgraded to 300 horsepower with additional jets. Includes 10lb bottle, braided stainless lines, stainless bottle brackets, four color installation manual, arming switch as well as every nut, bolt and electrical connector needed to complete the installation. Fits 1996-2004 GT mustangs and other 2 Valve 4.6L Fords. Note: some 03-04 models may not have a schrader valve on the fuel rail. For these applications, contact us to purchase part NX-16183 in addition. No one else gives you the bold clean styling of our Aftermarket Dress Ups, Suspension and Performance Parts for your American Muscle Car like UPR Products! Click Here for Instructions Click Here for Supplimental Instructions Fits these Vehicles: 1996 1997 1998 1999 2000 2001 2002 2003 2004 GT 4.6L 2V V8 Mustang Roush & Saleen Vehicles. Made in the USA!